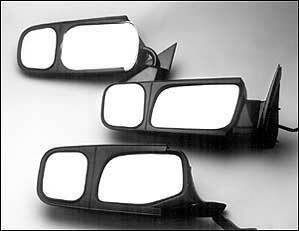 Ford truck mirrors ... click here for my recommended site for more info, pictures and prices! Now you wont have to pay the high dealer prices to replace that Ford truck mirror. CIPA has an extensive line of truck mirrors for you to choose from. Whether its a Ford truck mirror or a Chevy or Dodge you now can purchase a replacement mirror for your pickup and avoid the expense of a dealership. The OEM quality and ease of installation makes these mirrors your top choice if you have found yourself in a situation where you need to replace a broken truck mirror. Simple remove the old one (or what's left of it) and replace it with the new. Available in black or chrome finish and some are available in stainless steel to match the factory OEM look and quality. As always you will have the 90 day "no questions" money back guarantee. Simple call or email with your information and we will send a call tag and refund your money. Its very dangerous driving without trailer towing mirrors. Not being able to see traffic until they're right on top of you can cause knee jerk reactions that may cause you to jack knife your trailer. CIPA towing mirrors have are well know in the mirror industry. They have the "truck specific" mirrors. Cipa Custom Towing Mirrors slide over your existing mirror to give you added vision for towing and backing up into tight parking places. These are very easy to install and remove with no tools required. They are fully adjustable and do not obstruct your existing mirror. Don't want to replace your factory mirror? I don't blame you ... that can be expensive. Try one of the new slip on towing mirrors. These stylish additions attach to your existing factory mirror quickly and easily, giving you more vision and less hassle! Available in black finish, they won't cramp your style, just like they won't cramp your wallet. Cipa universal towing mirrors are the answer for those of you that have an unusual truck or a mirror that wont work with the custom "slip-ons". These mirrors are adjustable to fit every mirror on the market so you now have a solution to your towing vision problems. From Jeep Cherokee towing mirrors to Ford towing mirrors ... these work. They are easy to install and remove. They extend out 22" and have a 5" w x 4 1/2" h mirror face. There not the most stylish looking mirrors but they sure get the job done. CIPA also has a line of electric mirrors for those of you that enjoy the power of electricity. Push the button to extend and retract. Not only do "Signal" mirrors look cool but they also let drivers in your blind spot know that you are about to turn. They are available for most applications and are not very difficult to install.